In Build an Excel Add-In 1 – Basic Routine I coded a procedure in VBA to create a regular chart from an arbitrary rectangular range, including from a pivot table. In this post I will begin the process of turning this routine into an Excel add-in. The VBA procedure in Build an Excel Add-In 1 – Basic Routine is a subroutine which creates a chart using a number of built-in (hard-coded) options. In this post I will show how to make this subroutine into a modular function, which allows a calling procedure to pass these options into the procedure. 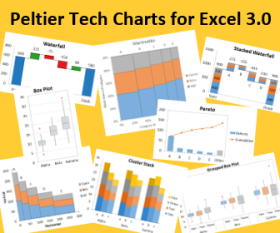 This adds the flexibility that allows the function to create a variety of charts based on different options. In a future installment of this series I will build a dialog (a VBA UserForm) which allows a user to select these options. The result of the function is a reference to the chart created in the function. The calling procedure has defined the values of these parameters, and our function has to adjust its execution to account for these values. MsgBox "Select a range and try again. ", vbOKOnly, "No Range Selected"
In the new function, DataRange As Range is passed into the function. The original sub assumes that there is one header row and one header column. The range containing the series values is offset one row down and one column right of the source data range, and reduced in size by one row and one column. In addition, it assumes that series are defined by columns, so the series names are defined as the top row, the category values as the left column, and the number of series as the number of columns in the series values range. The new function adjusts the position and size of the range containing the series values by the number of header rows and columns it is passed. The data orientation helps to define the number of series, the series names, and the category values. The original sub does not specify a chart type, so it creates a chart of the default type. If the user has not specified their own default, then the Excel default chart type, 2D clustered column, is used. The original sub mimics the Excel 2003 default chart object position, which is half the size of the active window, centered within the active window. If it is passed a range defining the chart position, the new function covers this range with the chart object. Otherwise, the function mimics the Excel 2003 default chart object position, using the largest pane instead of the entire active window. If the chart will be smaller than a minimum defined size, this defined minimum will be used rather than half the size of the largest pane. This set of calculations based on the splitting of the window into multiple panes is too complicated for this post, but it may be covered in a future post. Posted: Wednesday, January 6th, 2010 under VBA. In my experience, building the basic routine that does the actual work takes no more than 5 % of the total project time needed to create an add-in that behaves itself. Thanks for the notice. I think I’ve fixed the code layout problems. If there are any more problems with code layout in other posts, I hope my readers will leave a simple message like this one. Jon – Still pasting as a single line..
And thanks for your work, it is appreciated. I added white-space:pre; and it allowed copy/paste on multiple lines.